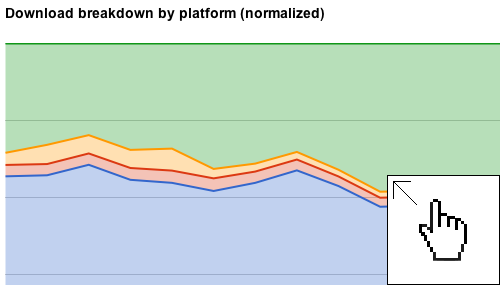 Author Amy Vernon wrote an interesting piece showing the change in download volume by platform over time at Sourceforge. Sourceforge is in an envious position from a data perspective. Few sites have as high a download volume for such a wide variety of projects. I thought it would be fun to put together some additional visualizations of the data. I started with some Excel charts, but user warpdude over at Hacker News turned me on to the idea of using the Google Visualization API. Just a couple of quick changes to the source of his example, and we have a set of interesting graphs showing the same time-series data. Update: Rich Bowen provided an insight via Twitter that much of the “other” data is from update services and non-browser requests. Hello, curl. We’re looking at you! Update 2: Have a look in the comments for an update from Rich Bowen further addressing the concerns regarding ‘other’. I frequently find myself in need of copying the path to my current working directory. Under OS X, you can pipe the output of any command to the clipboard using the pbcopy and pbpaste (see man pbcopy). Easy enough with pwd | pbcopy, but you end up with a newline. No problem, tr to the rescue. Use man <command> for more details about any of the above. alias cpwd="pwd | tr -d '\n' | pbcopy"
It appears that Backify, a popular remote backup service offering a free plan, has cancelled all free accounts. Backify was a reseller of LiveDrive, the company that actually owns the infrastructure and software. Ivo Flipse broke the news on his Google+ page early this morning. If it sounds too good to be true… There’s no such thing as a free lunch… Ok, ok, I’ll stop. This is, undoubtedly, a jarring experience for the many users of Backify’s service. The lesson learned is that even in today’s world of offloaded complexity brought to you by software as a service, the same rules apply. Caveat emptor, and all that jazz. This is a good time to take a step back and look at your backup strategy. I’ve read plenty of write-ups on backup strategies that involve copious amounts of drive shuffling and user maintenance, but the truth is that most of us don’t take the time for these tasks. After all, we all have plenty of other housekeeping duties like taking out the trash and cleaning the litter box. You do love cats, right? Where do you think all these cat pictures come from? Swapping out backup drives isn’t something I want to do, so I’m pretty sure you don’t want to either. Here’s my “no touch” backup strategy. Creates multiple copies of your data – what if one fails? Keeps these copies in separate geographical locations – what if you have a fire or flood? Works without your involvement – I’ll be the first to admin, I’m lazy. Runs quickly and frequently – what good is a backup if you lose everything you’re working on? Before we go any further, let me address the question I get most frequently: Do I need a backup? I won’t answer it directly. I’ll let the over 42 million Google results speak for themselves. Let’s talk about costs for a moment. The Backify situation underscores an excellent point. Things are often worth exactly what you pay for them. When thinking about your backup strategy, ask yourself this question: “If someone took my computer from me today, how much would I pay to get it back?” If your answer is “Nothing, I’d just go buy another one.” Stop reading here and go enjoy your carefree, zero-attachment life. No cynicism implied. Seriously, go back to what you were doing, and drink a cold one for those of us trudging away at our daily tasks. If you’re like me, your heart rate increased a little while asking that question. I’d pay large sums of money to get my computer back. If someone said, “I’ll give it back for $250,” I’d be elated. A good backup strategy is worth paying for. But Brad, the two paid services above only cost $150/year? You said $250! The extra $100 is because you’ll need to purchase a backup hard drive for use with TimeMachine, or Windows backup, err whatever. I recommend an external in the 2.5″ size (the smaller of the two available), because they don’t require an external power supply. You’ll need one that is at least as large as your computer’s hard drive. Larger is better, as TimeMachine will store multiple versions of your files if it finds the space. This is handy when you realize you accidentally deleted three crucial paragraphs from your proposal during editing. TimeMachine will let you recover a previous version. TimeMachine, Backblaze, and Dropbox all create separate copies of the files. TimeMachine backs up to the external disk on your desk. Backblaze backs up to their data center. Dropbox backs up to their data center, and in my case, to the other iMac sitting in my office, so it’s both local and remote. Outside of archiving to the Documents folder when my Dropbox folder gets full, the backup process is hands-off. I use DaisyDisk for Mac and WinDirStat for Windows to identify large folders. Because I leave the external drive plugged in all the time, and TimeMachine only copies new and changed files, it runs very quickly. Backblaze has to upload files, so if I create a large file, it can take a while to update. It is recommended that you exclude extremely large files from your Backblaze backup, but you do this at your own risk. Dropbox, because it can sync over my network, backs up very quickly to the iMac on Angel’s desk in my office. It also uploads quickly thanks to my Comcast connection’s fast 3 mbps upload. The really great part about this backup strategy is that it’s dead simple to set up. Each of these applications has a very simple installer that only takes a few steps to get running. When you couple that with the four points of solid backup strategy, I’m not sure I can do much better without a lot more effort. So what’s your backup strategy? See any ways I could improve my plan? Tell me about it.